Here are 10 ways to cushion the financial blow of paying for two, three, or more little freeloaders' snowy fun. If you are going to ski more than two weekends, a season pass may be the cheapest way. The best time to start thinking about this is during the current season, not at the beginning of the next one. Most ski resorts progressively raise prices as the year goes on. Vail's Epic Pass, which gets you into multiple resorts, is typically available by March. My family purchased the Lake Tahoe local version of the Epic Pass in October for $499 per adult and $239 for our oldest child. Even if you don't get a season pass, try to avoid buying your tickets at the resort ticket window. For one thing, waiting in the ticket line wastes some of your precious ski time. For another, the window price is typically the highest possible price. You can check with the resort website, local grocery stores, and ski supply shops for discount tickets. If you must buy at the ticket window, find out if there are any multi-day discounts available. Last year we were able to purchase three-packs at Sierra-at-Tahoe at a significant savings. Many resorts actually don't make you pay for small fries' lift tickets, but in my experience the staff might not tell you that. Other resorts offer a free kid's ticket with an adult purchase. Or they may let kids ski at least the rope tow area for free. When we had babies, my husband and I were sometimes able to get a "parent pass," which allowed one of us to ski part of the day, then hand the ticket off to the other parent while the first parent took over childcare. Timberline Lodge in Oregon offers a season pass that works this way, too. Mountains with a wide variety of Black Diamond slopes are great for accomplished skiers, but if your kids are going to spend most of the day on Green slopes or on a "magic carpet" conveyor belt, consider smaller, cheaper resorts. These places may also offer benefits such as closer, easier parking and a more family-friendly atmosphere. My eyes nearly popped out of my head when I realized how much we would pay to put our littlest skiers into all-day ski school last year. However, once they were dropped off, I realized how much benefit we were getting from the service. Not only did our kids gain a lot of confidence on skis, but my husband and I were free to get our money's worth out of our lift tickets, instead of spending the whole day helping our kids get up after they fell. Not only that, but I really appreciated that the ski school staff helped my little skiers into and out of their skis and boots. With more than one kid to help, plus your own equipment to deal with, that part can be exhausting. Do you ever see people with barbecue grills in the parking lot of ski resorts? They're the smart ones. For the price of a typical ski resort small burger and fries, you can splurge on all your kids' favorite junk food, nice deli sandwiches, foie gras, or whatever your heart desires. If you can get close enough parking, rendezvous at the car at mealtime. Or get a locker, or even pack simpler fare in backpacks. If you have a three day weekend, buy lift tickets for the first and last day, and plan an easy (and much less expensive) day of sledding or ice skating in the middle. With the decline of the snowpack in recent years, California resorts are putting in lots of alternative activities. A day of cross-country skiing or snowshoeing is also cheaper, if not less exhausting, than hitting the slopes. If nothing else, sitting around the cabin drinking hot cocoa and watching movies is practically free. It may seem counterintuitive since kids grow faster than they would wear out their skis, but experts say that you often get a better deal owning kids' equipment. Some stores offer trade-in programs for fast-growing kids. Swapping with other families or buying second-hand can also be a great saver. If you don't buy, a rental for the whole season can save frequent skiers time and money. Cabin rentals are quite expensive in the Lake Tahoe area, where we ski, and our family of five can easily fill up the average cabin on our own. However, since we're only there for a weekend, the kids are really fine three or more to a bedroom — especially if they're able to share with their best friends. This season we'll spend one weekend at Tahoe sharing a 3-bedroom with another family, and while it may be tight, we'll save money. Another advantage of skiing with another family is that if one or two kids get tired, there are more adults around to take turns caring for them. 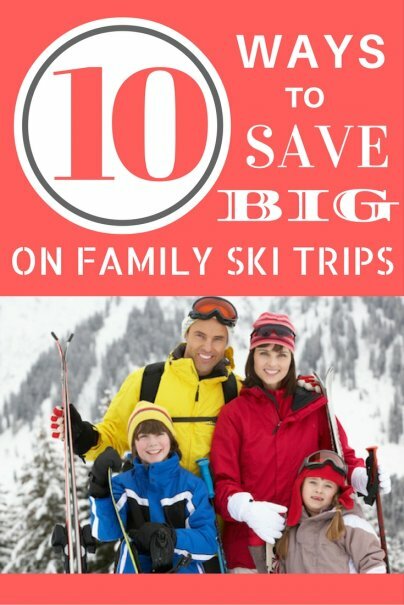 Do you take the whole family skiing? How do you control the cost?